As the head of the Jazz studies at the Western Australian Academy of Performing Arts, Jamie Oehlers plays a major part in shaping the future of creative music in the country. 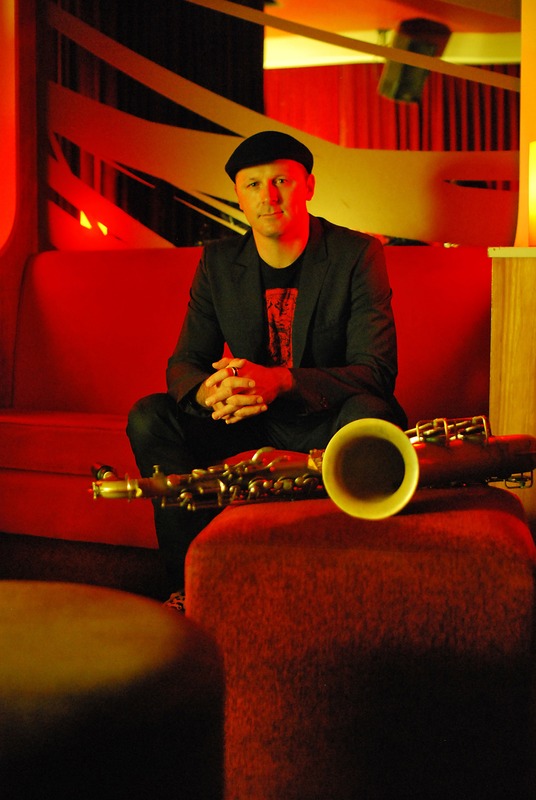 But it is his unique voice as a sax player, his assertive tone and big sound that has made him one of the most important creative forces in the Australian jazz community, a master musician on par with the best creative forces worldwide. This is going to be proven, once again, this Friday, when he’ll get on stage at the Ellington Jazz Club in Perth, for a ‘duel’ with another amazing sax player, Walter Smith III – a gig that makes for a good conversation starter. AustralianJazz.net: How did you end up doing a duet with Walter Smith? Jamie Oehlers: Walter and I met at the World Saxophone Competition in Switzerland in 2003 and got along really well, both enjoying each other’s playing and the influences we had in common. We played together at a jam session at the Melbourne Jazz Festival and had a lot of fun. On top of that, I was getting Walter out to teach at WAAPA as a guest artist and as you usually do with musician friends, you line up a gig! AJN: What do you like about his playing? JO: He has a really rhythmic approach to creating lines when soloing, a great sound and a loose approach that I like in saxophone players. AJN: How would you describe the dynamics between you two? AJN: What should we expect from your upcoming gig at the Ellington? JO: We are going to play some original compositions, but also some classic two tenor material from Griffin/Lockjaw, Stitt/Ammons etc. There will definitely be some bouncing of musical ideas between the two of us. AJN: Having worked with both Australian and American musicians, how do you perceive the respective approaches to jazz? JO: I’m not sure they’re all that different, to be honest. It’s a bit easier to be removed from the history of jazz in Australia, as it’s not such a dominant/over-arching force with the musicians here. Saying that, there are very few great Australian jazz /improvising artists who haven’t drawn from that history rather extensively, and there is a reason for that. Escaping at some point just seems at little easier here. AJN: How did you end up inviting Eric Harland and Reubern Rogers, to join you and Paul Grabowski for your new album? JO: The three of us have played quite a bit, performing at the Melbourne International Jazz Festival a few times and in a few other situations. I loved that combination of musicians from day one. There seems to be a freedom that is ever present when we play together. For me, that is the most important aspect to creating new music – feeling like it could go anywhere. Walking the tightrope, so to speak. AJN: What does the title “Burden of memory” mean to you? JO: I heard somebody use this phrase in an interview and it got me thinking about the many meanings behind it. It could be a past memory holding you back from moving on, an historic imprint that binds you to the spot. Friendships, family, countries at war, successes that create expectation, failures that create fear – all of these can be a burden on forward momentum. AJN: As someone who works with young musicians, but also as someone very much into the Australian jazz community, how would you describe what’s happening now, in terms of mastery, ideas, excitement, and so on? JO: There are a lot of really talented young musicians in Australia and it’s exciting to see what is being produced. The industry has changed a lot over the last 15 years or so and the younger generation are being forced to be super creative with the way they produce music, perform and survive. I see people thinking more about collaborations with other art forms and musical genres and this can only create some interesting directions. AJN: Is there something that makes Australian Jazz stand out as such, among other jazz scenes? JO: I do believe there is a bit more of a larrikin attitude with a lot of Australian jazz musicians, and this comes across in the music. People like Barney McAll, Scott Tinkler and Julien Wilson, to name a few, are incredibly individualistic artists, and I believe their attitude to music and life in general is an influence on this. They’re not playing someone else’s game – they’re making up their own rules. This is an inspiring attitude that is prevalent in the musicians I love in Australia. AJN: What is the state of creative/ improvisational music in Australia today? JO: I believe it is excellent. Let’s just hope George Brandis agrees. AJN: What are your hopes for the future? JO: I hope to see more support for the arts from not only government institutions, but the private and business/commercial sector in Australia. Unfortunately, I don’t think a majority of Australians understand the importance of art and culture. Everything we do is enveloped in the arts, from the music we hear on the radio, the television shows we watch, the community events that draw people together, the phone we put in our hand. Art is all around us and inspires new thought and communication. This is how we create an identity as a national – not through digging up coal. AJN: And your personal aspirations? JO: To continue to create music with the musicians I love performing with and to try and make some sense of it all for the next generation. Jamie’s expertise in all things jazz is greater than I ever knew it to be. Amazing! After having read the text of his interview, am I now even more proud of him? You can bet I am. I am his Grandpa !